Recently I spent some time playing with BOSH which is a tool for release engineering, deployment and lifecycle management of large scale distributed services. It is used to manage VMs in AWS and vSphere. The vSphere option seemed to be interesting to me and the idea of having private Cloud Foundry PaaS running locally on private infrastructure was exciting. The BOSH is under heavy development and it's sometimes difficult to make things work easily even if following various tutorials and blogs and I'm very thankful to the authors. As an infrastructure I created a cluster of 4 hosts ESXi version 5u1 (esxi1, esxi2, esxi3, esxi4) registered in igmlab.net domain (i.e. 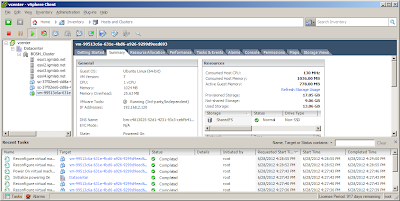 esxi1.igmlab.net). All of the hosts were powered by four core CPU wih 16GB of RAM and iSCSI shared storage (IET software based) of 512GB. The internal network had following characteristics: IP range: 192.168.2.0/24, GW/DNS: 192.168.2.107. For VMware vCenter Server SUSE based VM appliance was used (verion 5.0.0). Proper network configuration is crucial for correct deployment. 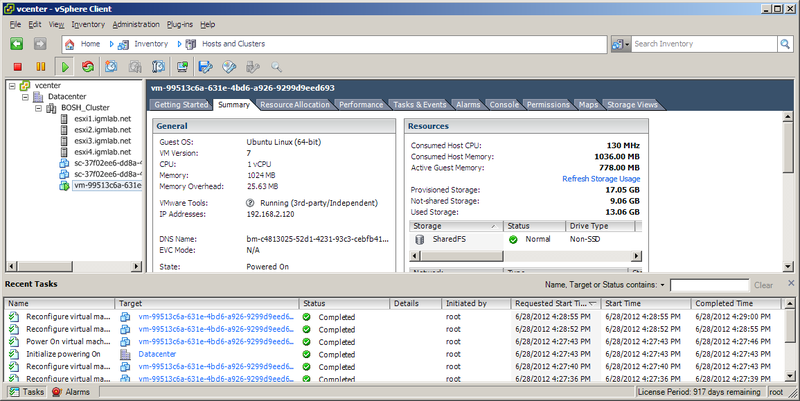 Bosh VMs run as guests in ESXi hosts and they access those hosts directly so both the hosts and guests have to share the same network. This is also the case for vCenter Server. We need to create deployments directory to store our deployment manifest files. Entire process takes several minutes (~20 minutes in my case).